I knew I was in for a treat the moment our press contact at Yamaha said, “here is your next boat,” and sitting at the dock was the 2016 Everglades 325CC with twin, white Yamaha 300-hp V6’s. You know when a luxury vehicle has that air about it? An air of quality and integrity? Well that’s what the 325CC exuded at the dock at the Miami International Boat Show. 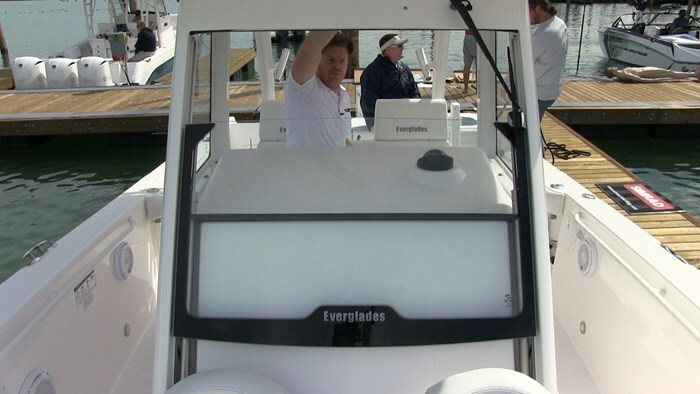 You may be new to the name Everglades boats, or its founder Bob Dougherty, but I guarantee that you know his work. 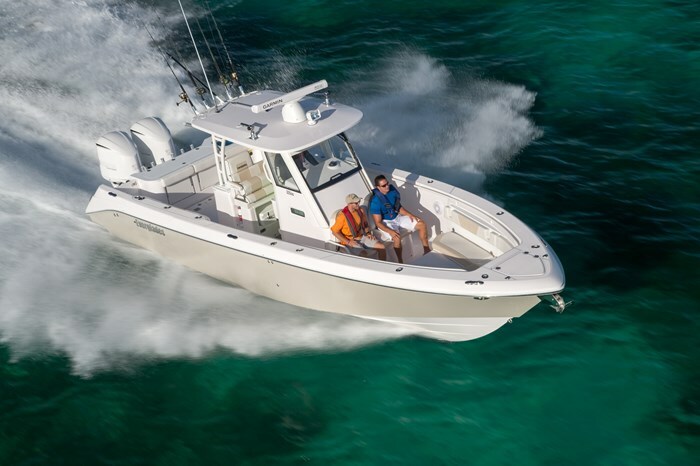 With over 50-years of boat building experience, Bob Dougherty got his start and claim to fame by helping Boston Whaler develop it’s famous unsinkable hull. Furthermore he helped them develop their very first deep V hull. In 1999 he discovered the RAMCAP assembly process that won him an NMMA Innovation award. In a nutshell most boats are built and then have their foam floatation injected into the empty spaces. Dougherty developed the process that involves building the foam floatation separately then building it into the hull as an integral part of the structure rather than blindly injecting it in. Looking for a change of pace and new challenge he started Everglades Boats in 2001 and brought with him his years of boat building experience and innovations along the way. Entering the 34-foot 8-inch center console through the port side dive door my eyes were in full scan mode as I took in all of the sights this big water fishing boat had to offer. What I immediately noticed about this boat was that yes, it was indeed a serious big water fishing boat, but what it also showed hidden features that would make it an excellent day boat as well. The aft cockpit was in fishing mode as the floorplan was open, the coaming bolsters were plush with rocket launchers everywhere you could look. 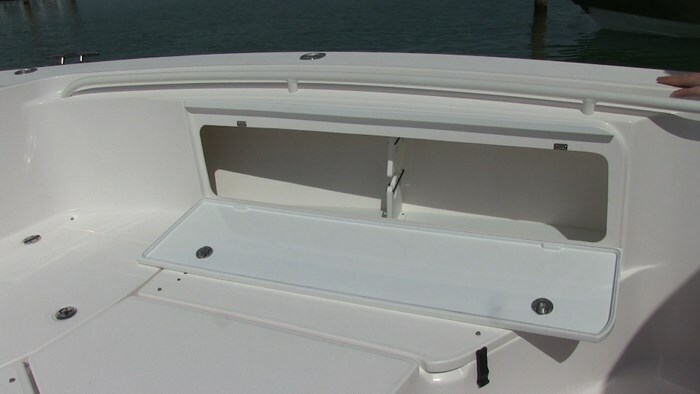 There was a large fish box in the transom and a baitwell directly behind the dive door. On saltwater fishing boats you can tell the difference between baitwells and livewells because they will be lined with a teal blue. This has a calming affect on the bait keeping them fresher, longer. 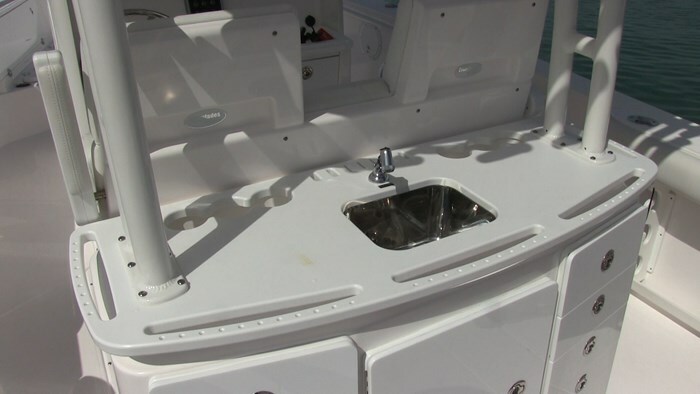 Also in the cockpit was a full bait prep station with 8 drawer storage, a main opening door and both a fresh and saltwater sink. But here is where things can get interesting. 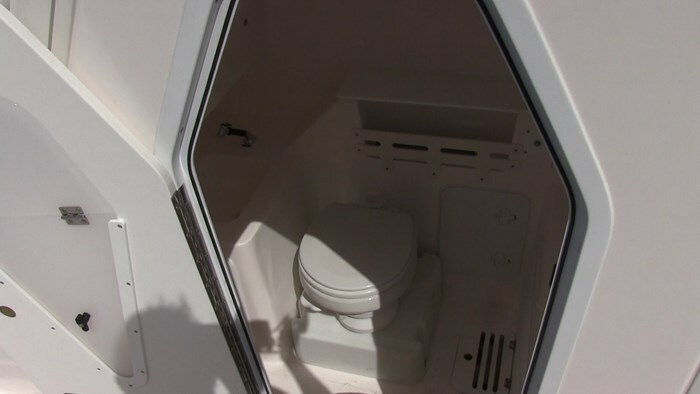 In the transom you will find two fold down seats with back rests. Add a BBQ, put the tackle away and use your bait prep station as a meal prep station and you’re now in entertainment mode. Everglades’ company philosophy is “quality is no coincidence” and that is apparent even at first glance and as I poked around more on the 325CC I was constantly more impressed. They way they set up their boats are that they should have everything you need on it. The only option you need to worry about is what hull colour you would want. Other than that the boat comes fully equipped with everything you need, save your electronics. Additionally everything you see on the boat is built in house. From the T-top, to the cleats, hinges and doors everything is built in house and to the highest of standards. The only thing that they source out is getting the powder coat painting done. The company they hire for this also does all of the painting for NASA, so no big deal. Just like the cockpit, the bow can pull double duty also converting from fishing to day boating with the flick of a switch, literally! 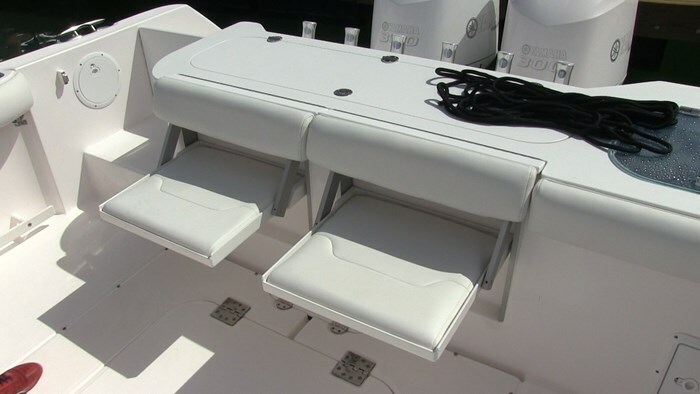 So you’re in fishing mode, you will notice a large, non skid casting platform with under feet storage as well as integrated rod lockers built into the gunnels. There’s a large fish box built into the floor behind the casting platform and the coaming bolsters again are plush and comfortable. Now when it is time to put the fishing gear away, you simply hit a switch and the center of the casting platform rises up in seconds and you now have table for entertaining. 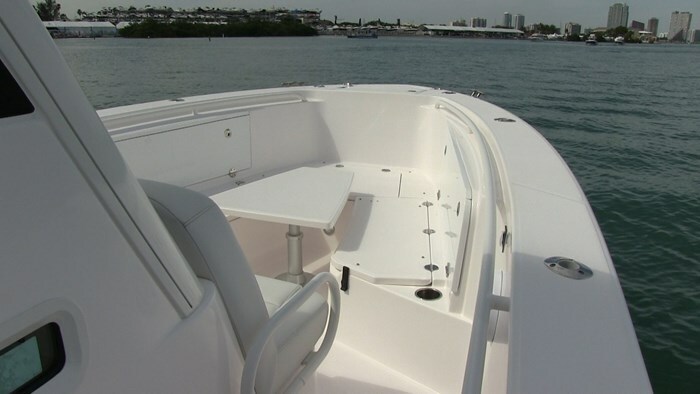 Add in the bow cushions and you have a first rate day boat and a place to enjoy a glass of wine when the sun goes down. Put the table all of the way down and put the filler cushion over top of it and you have a first rate sunbed as well. Behind this and forward of the center console you have a pair of jump seats that in a single word are luxurious. They are individually moulded with arm rests, cup holders and perfect lines of sight to enjoy the cruise out to the islands or the reef. When you step up to the helm of the 325CC you’re stepping into the command center. The dash and console is protected by a 3-sided windshield but if you want to feel the breeze in your hair then flick the switch and the Everglades Patented sliding windshield will slide down and give you an open concept. The dash has room to mount two, 15-inch navigation systems of choice, there’s room for radar, autopilot and radios above in the hard top and you can use the seat as a leaning post with the bolsters up or sit down for long hauls. For those long on adventure but short on good knees, the floor inside the helm has a built in shock absorber to keep you fresh for those longer runs back to port. If weather turns inclement there is a full enclosure available for the console but what Everglades has done is engineered a slide track system instead of using ugly snaps. It’s these little features and forethought that speak volumes about the company and impresses me a lot. What impressed me even more was the sea trial of the 325CC. As we idled out to the open water I knew right away I was going to be in for a treat. At low speeds there were no vibrations, no loose items to rattle and disturb the boating experience, just the sound of the water lapping against the hull and the twin Yamaha 300-hp outboards purring away. When we accelerated and got the 10,000 pound center console up on plane you could just feel that this boat was built to the highest of standards. Again no vibrations, no water sounds. It’s a hard feeling to describe, but it’s just like when you ride in a luxury car and you kind of just look around and know it’s a well built machine, well the same was with the Everglades 325CC. I just knew that it was a rock solid boat that could handle the worst conditions. We happened to have pretty favourable conditions which aren’t always ideal for testing a big water fishing boat so we had to create our own tests. After running in a straight line for a while I wanted to see how she handled the curves. Without backing down the throttles we set up for a starboard turn. The wheel turned, the engines responded and it was like we hooked up to rails as the boat just spun around, pushing G’s the same way you would get in a jet boat. What was more impressive was the Yamaha engines held their RPM at 5000 and there was ZERO blow out. None. Same with on the port side turns. The motors never blew out once. The hull kept a constant supply of clean water to the propellers which kept a constant supply of power going and we had turns that I have never experienced before in a center console of this size. Time to plane was a respectable 5.7 seconds and the cruising range was anywhere from 20 mph at 3000 rpm to 34 mph at 4000 rpm. Top speed was an impressive 50.7 mph at wide open throttle. There’s something that gets me every time about multiple outboards synched together and the harmonics it creates. The sound of power just seems to swirl around like a symphony for any gearhead. The Yamahas were the instruments and I was the conductor. The sound was magical. 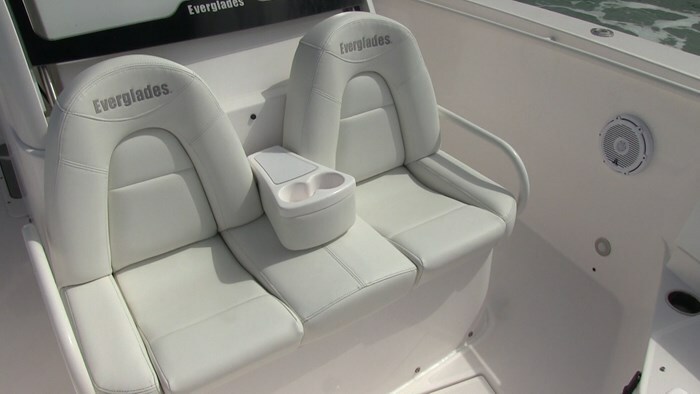 For my first test of an Everglades Center Console I must say the 325 blew me away. From every detail, the fit and finish and the performance, you can tell that there is over 50 years of boat building experience put into this brand. But don’t just take my word for it, it something you have to experience for yourself.